Kerry made the remark in London during the final stop of a trip that also included stops in Lithuania and France with the international response to the Assad regime's alleged use of chemical weapons dominating the conversation. 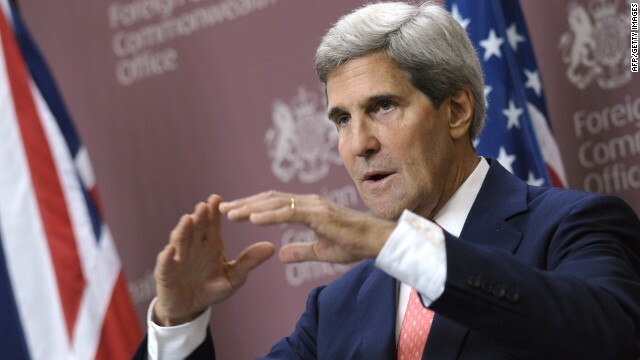 But the State Department soon sought to clarify Kerry's comment. The Obama administration says the Assad government was responsible for the August 21 chemical weapons attack outside Damascus, and that the attack killed over a thousand people. President Barack Obama is seeking congressional approval for a military strike in response to that attack. Kerry's point "was that this brutal dictator with a history of playing fast and loose with the facts can not be trusted to turn over chemical weapons, otherwise he would have done so long ago," Psaki said. "That's why the world faces this moment." Kerry is due to participate in a classified briefing about Syria to members of the House of Representatives after his return from London later Monday. It's about time that Russia begins to do what "world powers" are supposed to do! Russia has been avoiding it's responsibility in Syria, until we (the USA) threaten to destroy the Russian "gifts" to Syria! North Korea was acting belligerent toward the US until WE told China to make this little idiot calm down or suffer the economic consequences coming your way if you continue to do nothing! Surprise! NK made a 180 degree turn. Syria is Russia's misbehaving child, Russia needs to solve this! If Russia can't, then their status as a "world power" is NOTHING! Putin won't stand for being degraded! "NEVER AGAIN" IS A ISRAELIE BUMPER STICKER THEY HAVE CARVED IN STONE MONUMENTS IN THE MIDDLE EAST... IF YOU USE THIS CATCH PHRASE YOU ARE LIKELY A ANTI-AMERICAN AGENT OF ISREAL WHO IS A PLANT IN THE US GOVERNMENT. israel is not the usa and the usa is not israel. Works for me! Who in the hell are these idiots who advise Obama......When all they advise is to bomb, bomb, bomb. Seriously if this plan works, a solution without war....amazing! The Russians don't want Assad or wild Jihadists running around with Sarin gas either! Checkmate Obama! What's wrong with Assad winning? He might be a bad guy in our opinion but, he is better then the terrorist/rebels that used gas on civilians to pull the world into their fight. Sounds like a good plan, let's put WMDs, Nukes of all muslim countries under UN control, you can't trust these people. Always with the ignorant racism. are you posting under Saeed too !!! No im BIG SHIZ bit ch. Destroyer of racist a s s holes like you. Tell me whorge patton, why not destroy all the world's WMD'S? too much work, so just take them away from people who are most likely to use them, like middle easterners and pakistanis. I still think you're posting under Saeed. To much work? No I think you like the idea of the people you want to have them having them. It's the same reason we still use oil and gas instead of natural energy sources that are in abundance on this planet. Greed, ignorance and arrogance. And your still a bit ch. Muslim is NOT a race. You can't choose your race. However, you CAN choose your religion. A huge difference. Who cares about semantics? Prejudice is prejudice. Christians have done just as much bad in the wrold as Muslims. I am not prejudiced I hate everyone equally; don't get me wrong, I always look for muslim girls in bar. I Weep with relief,in the hopes that now, we can begin to build an international coalition based on the commitment that chemical warfare be abolished and never tolerated Let us all reach for a peaceful resolution and conclusion. .Let the Russians,the U.S.,France,the Arab League,Israel and all nations join together in the mantra "Never Again". Have fun in your dream land. Iran should give these Russian s c u m there busherhr reactor also back go home to Russia you eastern European s c u m you are in league with USA and Britain don’t worry Iran is going to finish the arak reactor about 5 months from now go home Russian f i l t h.
Hay saeed, I thought it was agenst the law to be a gay Muslim is your country? Don't worry I won't tell anyone. The evidence I am waiting for is the chem signatures. In the "field" manufacturing there will be trace contaminates. If the rebels tried to replicate the weapon chances of a styeral facility are next to zero. We would be looking for traces of everyday stuff dust, or fibers not existent in a styeral environment. Lastly Syria what are the possibilities that al quida has infiltrated your ranks? The problem is without action as proposed by the Russians some group is going to wind up with Chemical weapons when this Syrian debacle ends. The Rebels infiltrated by Jihadist etc or Assad. I like the Russian concept and most other middle eastern nations as well as others who have so much to lose do to. Kerry wants to do them harm, so he cannot be trusted. Amerika, not Syria, is the one that needs to be under "international control". Excellent idea; why didn't the US bring this up before they decided they had to respond militarily. f u c k russia all the jews in israel come from s c um b a g eastern europe this is a trick russia wants to steal other countrys legimite right i tell the russians go home to gay russia and take a d i c k up the a s s.
Sec. Killer is just a goddam liar. Turning over their chemical weapons to the UN would leave them defenseless in the face of a rebel rebel group with small amounts of nerve gas. Have Amerika give up its biological warfare capability instead. f u c k russia these disgusting europeans this is a trick dont fall for it syria the second you give your chemical weapons they will luanch a full scale attack keep your protection and deterence dont end up like saddam and gaddafi. What's the matter, saeed, got tired of hacking the NY Times website? This is a reasonable solution. I don't trust the rebels at all either. I think eliminating the nerve gas is the best step without getting involved in WWIII. We should back Russia wholeheartedly on this and put some ownership in their hands. I am glad this opportunity has arisen with calm leadership by Obama. The GOP probably would have attacked Turkey by now. To Russia this is a good compromise. Syria surrendering these weapons only helps your cause. To eliminate further potential loss of control or allegations this would be a positive step forward. Deciding who would take these weapons stock piles is difficult as I would prefer personally that the stock pile be destroyed. I am not in your shoes, I do know what you face. Tell me more. Who would take control, for how long? syria should not give up its chemical arms look at gaddafi he gave up his chemical weapons and ballistic missile program and saddam and iraq also destroyed its chemical weapons both of the gaddafi and saddam ended up dead. syria should keep its chemical weapons as protection and deterence. It's good to see Russia taking a leadership role. Someone had to fill the void the U.S. has left. Thank you Russia....I hope this happens. Yeah the only fear that Obama administration has is about the chemical weapon being in the wrong hands, and US population do not see that...I say send to this dictator a clear message that we saw the children of Syria dying by gas and all that is his fault.....Bomb the dictator !! If Russia succeeds in forcing Assad to turn over his chemical weapons that is a big win for the world. It puts Russia's Putin head and shoulders above Obama and once again proves that the US is nothing more than the world bully. I don't think my government is smart enough, honest enough or strategic enough – but – I wonder if this was the US plan all along. The United States buys its bombs, missiles, planes, and the whole bombing infrastructure from private companies. Someone gets richer every time an American bomb is dropped on someone. I want to know exactly who gets richer. And I want to know what lobbyists they've hired, whose election campaign they contributed to, and which congressmen they have paid to go on "fact-finding" missions. I think the connections would be interesting. Which companies supply the government weapons is not a secret. The US should take the money out of politics. A person or a corporation should not be able to donate money to (bribe) a candidate or political action committee. All elections should be publically financed so the average person has a chance to be elected. Why should millionaires be the only ones that can hold political office? There is no need for the US to get involved militarily in the Syrian civil war. Do you want to pay $10 for a gallon of gas? If the US was not concerned when over 100,000 people were killed we should not launch an attack if 1000 Syrians are gassed by their own government. The US should seek a diplomatic solution through the UN. Russia's idea that Syria give up its chemical weapons is a good idea. I am opposed to the US acting without strong UN support in Syria. I believe we are combing two issues out of convenience. 1. Should the UN respond with military might to the use of chemical weapons in Syria? I don't believe the UN made it clear to Syria that a cruise missile response would be coming if they used chemical weapons. How can we punish the bully for crossing the line if we drew the sand in the line behind him? 2. Should the UN or US intervene in the civil war in Syria? I believe the rest of the world cannot sit idly by while hundreds of thousands of people die in a civil war. I would like to see a widely supported UN peacekeeping force be put in place. First seal the borders and stop the in flow of weapons, then work with the various factions to hold a UN monitored election. Get China and Russia on board or act without them but with a widely supported UN base. The US cannot be the peacekeeper for the world, but it can have a strong stance in the UN actions. I like Russia's idea. If they are innocent, they shouldn't mind turning over their weapons. If they don't we know they are lying. I have just read that Syria agreed with Russia's proposal, agrees not only give everything to international control but destroy all chem. Yes. Exactly the correct response from the Russians. John Kerry is a maniac. Is this a Congressional election year? I just want to know who I'm voting against if they vote for military action. It's the only language politicians understand, the language of being voted out. The voice of the American people must be heard on any subject that involves American tax dollars and military assets.